It’s been two weeks since I last posted. So much has gone on since March 28th. Let’s see if I can remember everything. Bill retired!!!! His last day working was Thursday, March 28. I asked him yesterday if things felt different to him. He said, “Not too much. It just feels like something is missing.” I totally understand what he is going through. It plays on your mind. You’ve dedicated yourself to one employer for 20-30 years. You spent more awake time at your work place than you did at home. You had all that responsibility and now you don’t. And, it’s not that you want to work anymore or have the stress of it all . . . but, it’s missing from your life now and it takes some time to get use to it. Yes, I understand. I was like that for six to nine months even though I loved being retired and the freedom it gave me. I sure don’t have those missing feelings anymore. I’m too busy to work! 😀 Bill has so much to keep him busy in retirement that I’m sure it will not plague him very long. And, I do believe sometimes it is harder for men than women. Sometimes work is their whole identity. We spent five days down at Jill & Jim’s starting the day after Bill retired. We did not get to drill for water. We’ve rescheduled that for April 22. However, Bill did take down a dowsing stick thanks to our neighbor’s willow tree. He (and others) tried it out to see if we could find where to drill for water on our property. 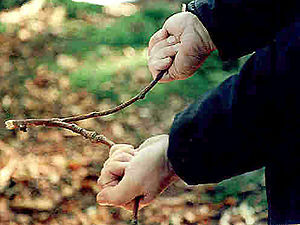 According to several websites Bill looked at, you have to hold the stick like in the picture below. You hold the stick like this. 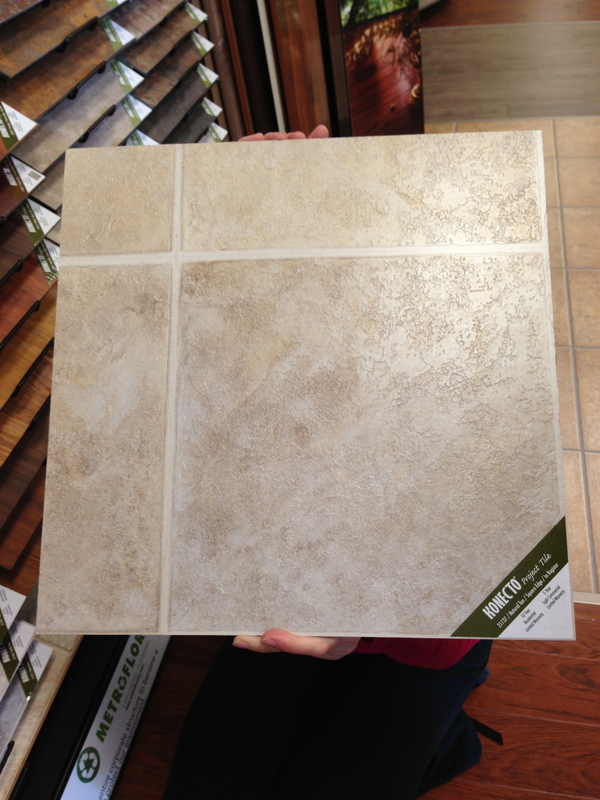 While we were down in the area, I wanted to make some decisions on flooring (hardwood, carpet and tile) and tile for the master bathroom shower. I wanted to make sure when we sent out for bids this time, we got bids back on what we actually wanted. We went to BK Flooring on Friday after we got down to Jim and Jill’s. One advantage of being retired, we didn’t have to rely on going on a weekend and there was only one other customer there. We really got a lot of one-on-one help that day and part of the time we had the owner helping us. Here’s what we picked out. 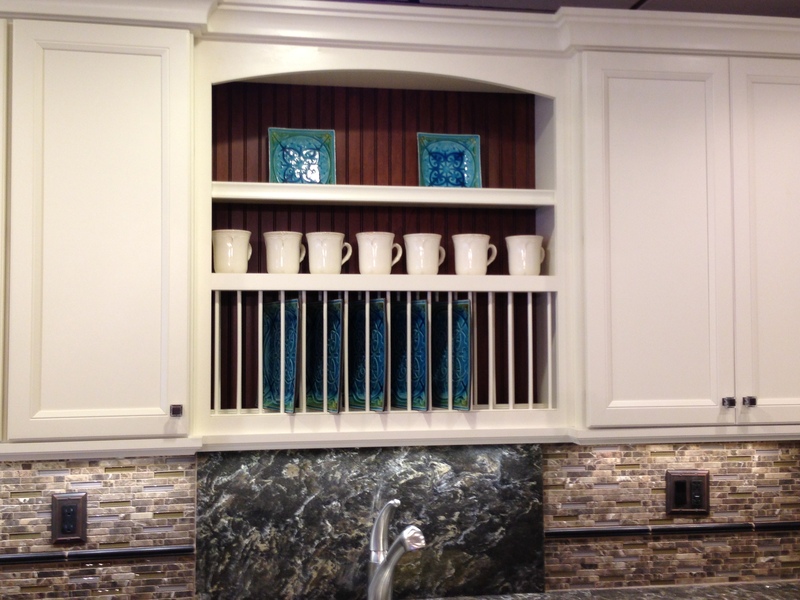 I also took photos of some cabinets and a back splash that we liked in the showroom. This is how I want Bill to make two upper cabinets in the dining area. Bill has always wanted someplace to store wine. Maybe this could go in the dining area cabinetry. We made a very quick stop at another Lensing building to get a quote for garage doors. We made it in right before they closed for the day. 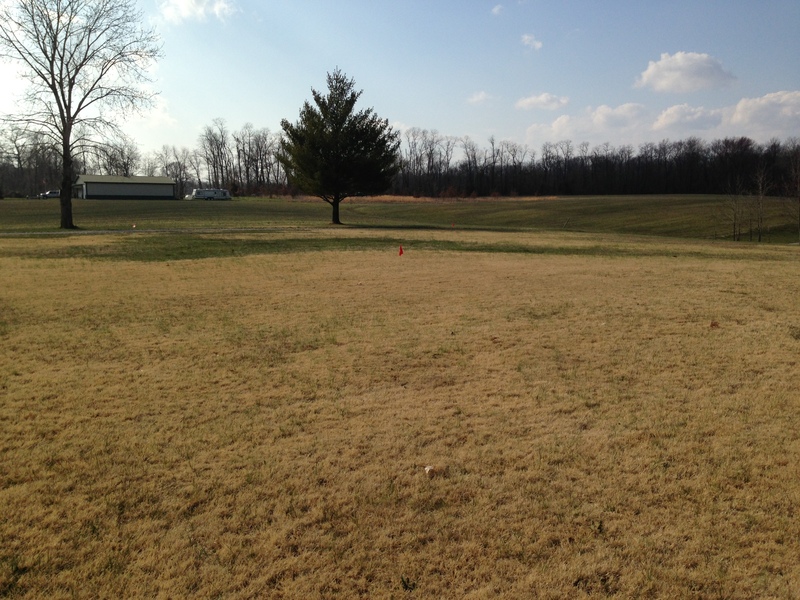 It was exciting to see the flags and stand where the house and pole barn would be. It made it real. However Bill and I had a very tense situation when I said I thought the pole barn was too close to the house. That didn’t go over too well with Bill. 😕 After much discussion of how we could remedy the situation we finally came to the conclusion to change the orientation of the pole barn from west/east to north/south. It’s much better now. After seeing the layout of the house and pole barn, it really dawned on me that it wasn’t going to be like our present home where the pole barn sits way back from the house and you cannot see if from the street view. This new pole barn was going to be VERY visible. I decided I wanted it to look cute. 🙂 Well, not girlie cute, but I wanted it to look nice and match the house. But, if we really wanted to match the house, we would have to use the same fiberglass siding we picked out. Usually in that case you would build a stick-built building (like the house). I did a little research. Then, I approached Bill with the idea. He said he wasn’t opposed to the idea. He said we’d talked to the original post frame building company (Hobgood Post Frames) at our appointment the next afternoon. We met with the Morton Building rep the next morning and went through all the options. All I wanted out of the deal was to make it look cute. I thought a weather vane cupola would do the trick. I asked the rep to add that to the quote. We did get the quote a couple of days later. We cannot afford a Morton building! Jill wanted to take Bill out to eat to celebrate his retirement. We made plans to meet Jim and Jill at a restaurant close to BK flooring. We decided to make another trip there to discuss flooring for the large laundry/pantry/exercise room. 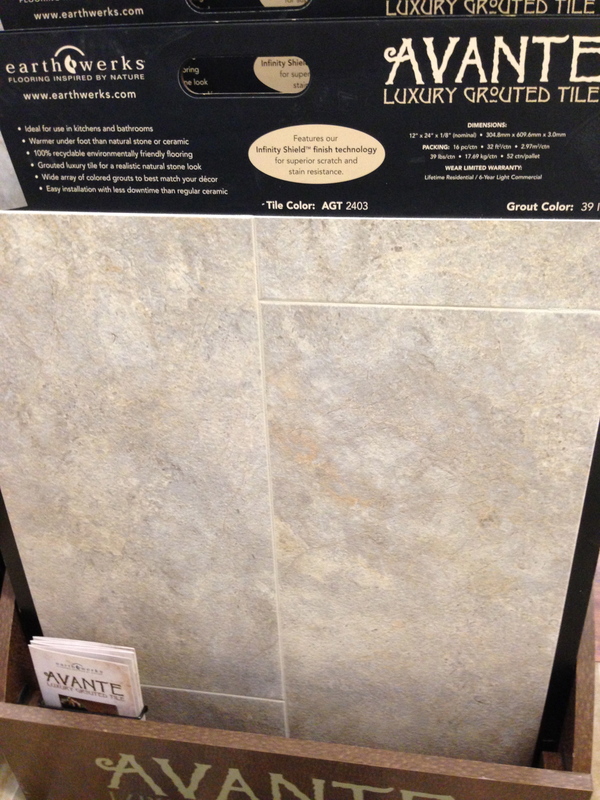 We really liked this new clickable luxury vinyl grouted tile flooring we had seen at the home show. It looked just like ceramic tile. I had priced it locally, but had not priced installation. Turns out that with the cost of this tile and installation, we were getting up to the cost of ceramic tile. That wasn’t going to work. We were looking to find something that would be cheaper. We kept saying, it’s just a big laundry/pantry/exercise room. We would rather spend the money on the other floors. 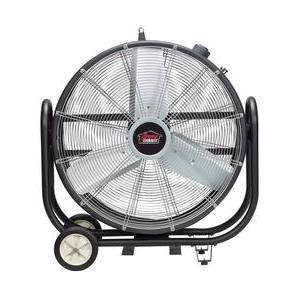 We ended up settling on a heavy-duty vinyl that’s waterproof, mildew, mold and odor resistant. And, the tiles connect. Easy installation. And, the price and installation fit our budget. After picking out the flooring, we met Jill and Jim for lunch at Culvers. When they went back to work, Bill and I decided to look at a new subdivision which had out buildings next to the houses to get an idea how others had recently matched the two. After seeing these buildings, I told Bill I had a problem with matching our house’s Rock Garden Green siding with Clay trim to the pole barn. If we used Clay color as the main part and green for the trim and the bottom wainscoting, I thought the pole barn would look very agricultural. 😕 And, that wasn’t the look I was going for. 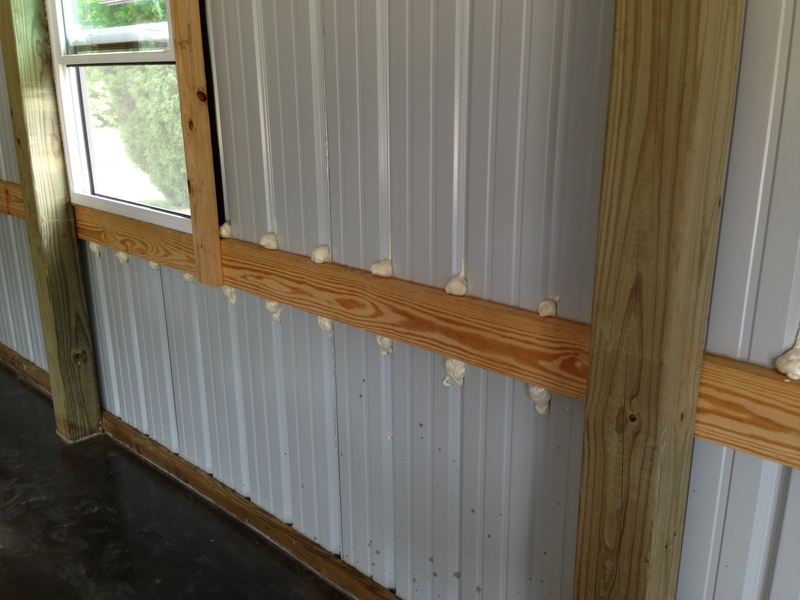 After seeing several more Clay with Green trim pole barns, Bill agreed. Now what? I asked if we could drive past the house near our property which had the Rock Garden Green siding. I was having second thoughts. I thought I could go with that bold color. But, would we be happy with it. What would we do about the pole barn colors if we stuck with the green? Aucckkkkk!!!!! As soon as we drove up to the Rock Garden Green siding house, I knew I couldn’t use that color. 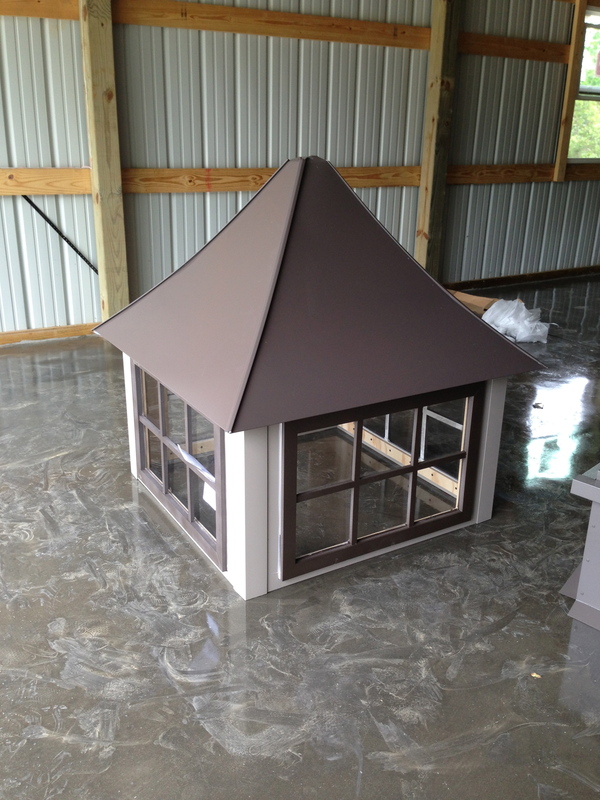 But, I loved the Clay color and I always wanted to use the Bronze fiberglass with the house. So, that’s what we decided to do. Clay will be the primary color of our house with Bronze as the trim. I like those colors and they would look fine on a pole barn, too. One thing that the house color change affected was the exterior color of our windows. We had pretty much decided to go with the Andersen casement windows because they had the Sandstone exterior color that matched perfectly with the Clay trim if we were going with the green for the primary color. Now that we were changing colors, we needed the window exterior to be Bronze. Turns out that Andersen doesn’t carry a Bronze exterior color. Yikes! I did some research online that evening and found that Integrity by Marvin and Marvin Windows have the bronze exterior. Of course they should because the Apex siding is made by Marvin. Bill and I decided to stop by two lumber companies the next morning to check out Marvin and Windsor windows before we headed out of town to go back home . After packing the car the next morning and saying our goodbyes to the family, we left Goldie at Jill and Jim’s and headed off to Complete Lumber to check out the Windsor windows. It was the window guy’s first day on the job and he wasn’t familiar with the product. We didn’t like the sample window we saw because when you took the screen out, it scratched the window handle. We really didn’t know anything about these windows so I grabbed a brochure and told the guy that we’d do some research and get back with him. We headed to Kight Home Center next. This was a great place to see different brands of windows and doors on display. We met with Joe who spent a lot of time with us pointing out all the advantages of one product over the other, giving us many printed quotes, and coming up with a front door solution for us that we liked – finally! Looks like Integrity Casement or Marvin Casement will be our windows of choice. Just as soon as we were headed back to pick up Goldie, Bill gets a call from a sales rep at Complete Lumber. He had called Jim to get our number. He’s a friend of Jim’s. He said if he had known we were stopping in earlier, he would have been there. He had a new Windsor window that he wanted us to see. Back and forth, back and forth. Our property is a little far out. It was a little distance going back to this company, but we said we would. First, we go and get Goldie and load her in the car. Then we head back to Complete. We met with the sales rep who was so nice. He showed us the new window which was really nice. We asked if he could get us a price for a standard size window and email us later. We actually got the quote before we got home that evening. We won’t be buying those Windsor windows. They were a lot higher than the Marvins. Just wait until you hear everything we’ve been doing since we got back home . . . It will explain why I haven’t posted in the last two weeks. I signed up for Social Security on Tuesday this week. Knock on wood, so far my experience has gone a lot smoother than Bill’s. It started out a little rocky, but ended up okay. I had made an appointment for Tuesday at 9:00 am. I was told it would be a phone appointment and I would not need to go to the SS office. Worked for me. However, by 10:00 Tuesday, I had not received a phone call. I actually thought my phone wasn’t working, so I called the national SS phone number. They said someone would call me before 3:00 pm that day. Around noon I got a call from the downtown SS office with an apology that the office I was assigned to was short-handed that morning and no one had called me. It was all good and I was able to get all signed up. I should get my first check in April. Regarding dental/vision insurance – After we had decided to not buy a dental and vision insurance or discount plan, Bill continued to search on the Internet. He found something about a discount plan that Delta Dental had for residents in certain states (Indiana, Michigan, and Ohio). For $80/year fee for a whole family, we could save an average of 20-40% on dental services, receive discounts on hearing care, and vision care. The cheapest discount plan we had looked at earlier was almost $600/year premium for both of us and they didn’t provide hearing with their plans. The deal on any of these discount plans is that you go to one of the participating doctors/services. We decided this would work for us and we enrolled. The $80 fee will pay for itself after one of us gets a cleaning. Thank you, Bill, for finding this. Thought I’d post about this in case others want to look into it. Here is the link: Delta Dental Direct of Indiana. I forgot to share the kitchen cabinet scare we had last weekend. Bill had finished building the refrigerator cabinet and only had the cabinet to go above the refrigerator left to build. He decided to line up all the cabinets to mimic how they would look in our new kitchen so we could make sure everything was correct before he started building doors and drawers for the them. When you look at the pictures below, note that Bill rested the small upper upper cabinets on top of the base cabinets and then the upper cabinets on top of them. 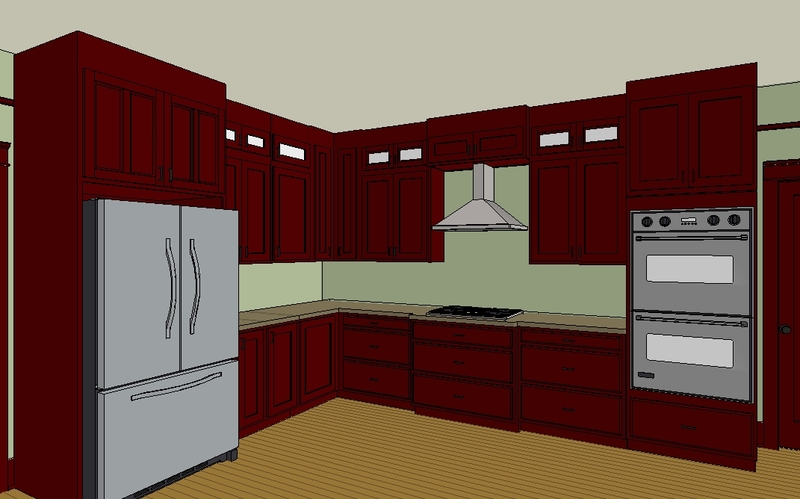 Actually, the upper 36 inch wall cabinets will be mounted about 18 inches above the countertop, which is standard. And the upper upper 12 inch wall cabinets will be mounted above the upper cabinets. I wanted the cabinets to go up to the ceiling. There will be a 4-1/2 to 6 inch moulding to reach the ceiling – similar to Jill’s cabinets, but Bill is also adding a crown moulding. Obviously, I will never be able to reach those upper upper cabinets. The plan is to put LED lights in them and display something (not sure what yet) in each of them. Is this kitchen set-up right? I quickly tell Bill about my findings. He comes over and looks at the house plans and looks at the photos. He said, “Well, maybe I did make the cabinets correct but lined them up wrong. Maybe I don’t have to make them over!” Now, I was even more worried about us building this house. 🙂 While the rest of us went to the Children’s Museum for the day, Bill stayed home and set-up the cabinets the correct way in the pole barn. Turned out Bill didn’t have to re-make any of the cabinets. Yay!! The Spring that Never Sprung! It was time to sell our present home. It was time to call the realtor. Bill and I had interviewed a couple of realtors last summer. We kind of clicked with one – Mike Puckett. Maybe it was his age. Maybe it was his business background. We had not talked to him since June of 2012. I gave him a call and we scheduled a meeting for March 12 after Bill got home from work. Our temps did reach low 50s two days that weekend. I itched to get outdoors, even if it was to pick up sticks/branches and clean out the flower pots on the back patio. At least it was a start. I remembered the year before having 80 degrees during March and I cut grass a lot during that month. Not this year. The grass is still brown, trees bare, and no new spring buds sprouting up. We still have a lot of work to do outdoors before selling the house. Unfortunately, it entails using the power washer. You can’t get that going until you can turn on the outside water. It’s been too cold for that, too. Shifting gears to the new house, I had to do some more online ordering. With the change of the vault and the mirroring issue, we discovered we needed another light fixture (for the entry) and another door knob (for the pole barn). I was waiting to order the door knob when I had other materials to order so I could get free shipping. This was perfect timing because we had gotten our tax refund back. 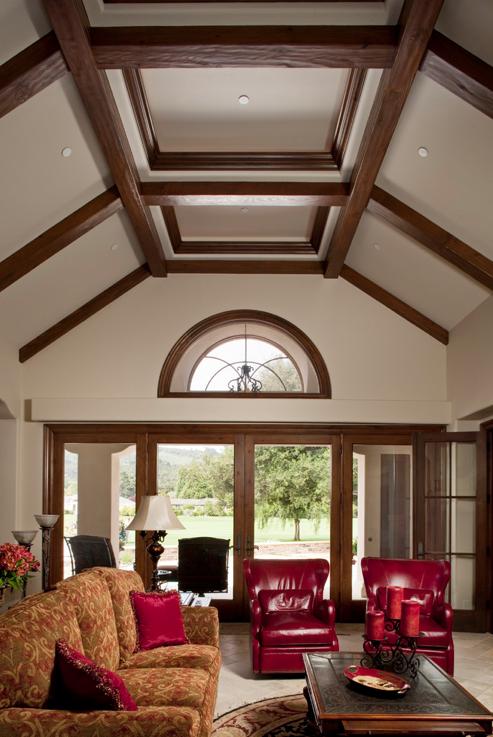 When we changed the vault orientation of the family room, Jim had lengthened the entryway of the house. The entry has a 9 foot ceiling. I had purchased two sconces for the entryway, but now that wasn’t going to give enough light. I actually let Bill have final say for the light fixture. Surprised? I think he was, too! Actually, I’m trying to be more open to listening to his reasons. I was looking at a chandelier fixture. He thought it would be too large and would hang too low. He was right. (I’m sure he will have a huge smile on his face when he reads that sentence!) 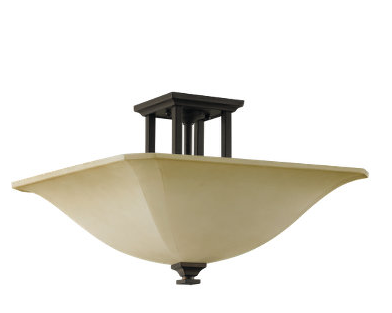 Here is the light fixture we picked. It matches all our other interior light fixtures. I found the light on sale at an online store for $50 cheaper. Build.com matched the price. The other big purchase on this order was flood lights. Should we buy incandescent, halogen or LED lights? We determined that the LED flood lights were too expensive. Halogen lights cost less than LED but more than incandescent. Bill put me in charge of researching the difference between the incandescent and halogen. Halogen bulbs function similarly to incandescent bulbs, but with a few key differences: They’re composed of a small, pressurized, peanut-size bulb inside a larger outer shell. The gas inside this inner bulb is halogen. When tungsten evaporates from the filaments of these bulbs, the halogen combines with it, escorts it back to the filament where it’s redeposited, then heads out to round-up more escaped tungsten particles. Since there’s less soot on the bulb’s shell, light output remains strong, and since filaments are constantly being rebuilt, the bulbs last longer. But the key difference— and the quality that makes them useful and unique—is they emit a whiter, brighter and more easily focused beam of light, almost like real sunshine. 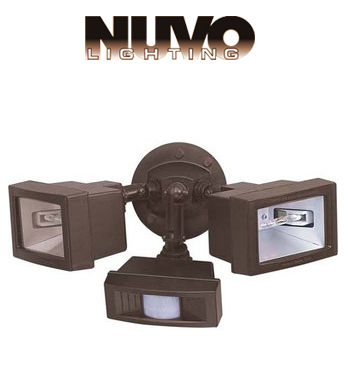 For outdoor use, halogen floodlights cast a brighter, easier-to-see-by light. And since they last twice as long as standard bulbs, you won’t need to struggle to reach hard-to-access outdoor fixtures as often. They have other benefits too. They’re 10 to 20 percent more energy-efficient and cheaper to operate. They burn brighter longer (a halogen bulb will still be cranking out 94 percent of its original light output near the end of its life, while a standard bulb diminishes to a measly 82 percent). The realtor called us on Sunday, March 10, and apologized that he now had a conflict for March 12. He said he could meet with us the next evening, March 11. Before I could change my mind, I said, Yes. I went into cleaning mode the next morning. When Mike arrived he asked for another tour of the house. Then we settled down at the dining table and talked about comparisons of houses around the area. He came up with a listing price. We were happy with that price. I provided him with a list of all the improvements we had made to the place in the last several years. He said I must have read his mind. We talked about how we would be contacted when someone wanted to see the house. He said he would write-up the contract and email to me within a couple of days. Mike pays to have a home stager meet with his clients to go over suggestions before taking pictures and putting the house on the market. We decided to leave the listing date open until after we met with the home stager and see how much more he/she might suggest we do. Two days later I got a called from Gary Barnett at Home Matters to set up an appointment with one of their Property Stylists. Bill wanted to be here when the home stager came. We made an appointment with Gregory Henry for Tuesday afternoon, March 19. I’m a HGTV addict and watch all the shows – House Hunters, Property Brothers, Kitchen Cousins, Love it or List it, Income Property, Candice Tells All . . . I’ve watched them all over the years. I knew that de-cluttering was a big thing. I thought I had done a pretty good job so far. 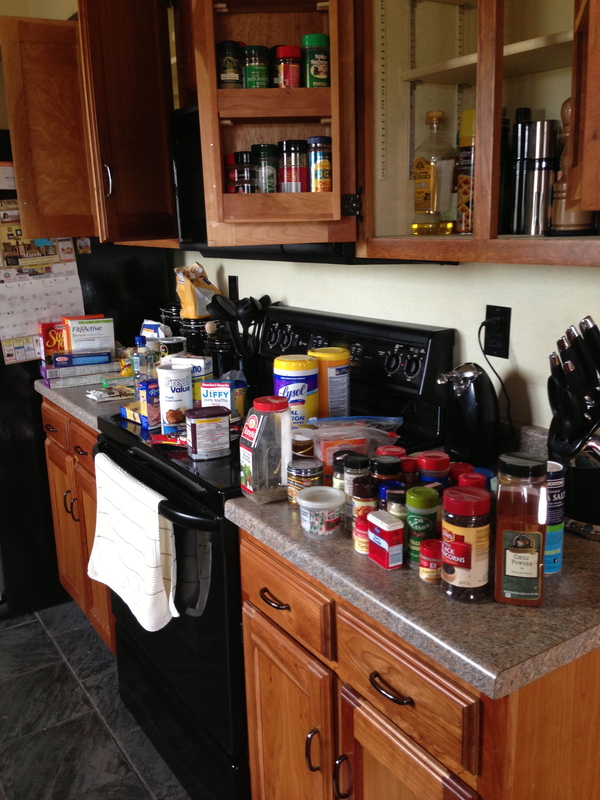 However, I knew I had to go back and re-organize the kitchen cabinets that held food items. And, since Mike suggested that we sell our refrigerator with the house, I needed to clean that, too. I wanted to get that done before Greg came. Here is how I go about my de-cluttering. I take everything out. It forces me to do something with all that mess after I get it out of a shelve, closet, or room. Then I clean the empty space. After that I categorize whether to pitch or keep. Last, I place the keep items back into cabinets, closet or room in a way that will work for us. It got to be a crazy week and weekend between the realtor and the arrival of the home stager. I shifted gears again and focused on Medicare medigap insurance plans, drug plans, and dental and vision plans. We finally got word from the retirement specialist that I would have health insurance after Bill retired, but neither one of us would have dental and vision insurance after the end of March. We had worked for several months with a Medicare insurance broker, Matthew Frankic of Crosspointe Insurance Advisors. He was helping Bill and me understand all the different supplement plans and the ones that would fit Bill’s needs in health care and prescription drug coverage. Bill asked if I could do research on all the dental/vision plans that Matthew had sent us via email. Going through all this Medicare stuff the first time isn’t easy. I ended up pricing out the 4 or 5 options and creating a spreadsheet so Bill and I could sit down and compare the plans. My head was spinning. I had reached a point where I didn’t even know how to compare what we would spend each year. Unfortunately, Bill and I spend a lot of time in the dentist chair. 😦 We were a little anxious not having insurance. We ended up sitting down together on Saturday, March 16, to study the plans and make a decision. After much discussion and I think only one flare-up 🙂 we decided we would self-insure ourselves. Meaning, we decided that we would be paying so much money out of our pocket for the insurance premiums that during a good dental year, we would not get our money’s worth. Decision was no dental or vision insurance. It was a risk we thought we’d take. Then we settled on which medigap supplement plan and drug plan for Bill. Whew! We had a phone meeting with Matthew on Monday, the 18th, to sign up for those. Glad that was done. Bill spent the rest of the weekend out in the pole barn re-working the cabinets and trying to straighten up the pole barn as best he could before the stager arrived. The two things Bill and I have struggled with the most on choosing for the new house are flooring and the front door. I’m hoping we get the flooring settled this weekend when we go to a couple of flooring stores down south. We saw the fiberglass front door we originally picked out (not cheap) at the Indy Home Show in January. We thought it was too lightweight. Neither one of us wanted to install it on our house. 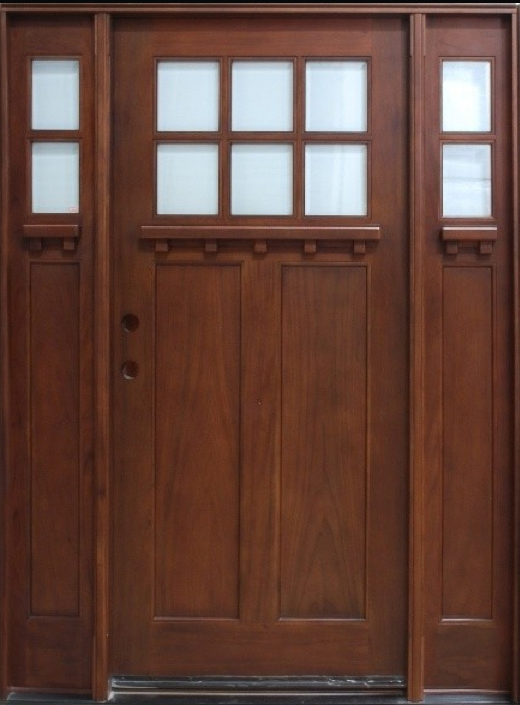 So, we went back to looking at wooden entry doors. This is the one we think we are going to buy. But, we are waiting to order it after we move south. When we got back to the house we started in the kitchen. He opened my cabinets and grinned. Then he said, “I could blog all day how good this looks!” He told us what things to put away during showings (like trash can, my utensil crock, my knife caddy, and paper towel holder). And, he staged some of the items I had – I took pictures so I wouldn’t forget. So, folks, this is where we are now – working our butts off trying to get as much done as we can. I thinned out silverware and utensil drawers and packed a bin of stuff. I cleaned out the coat closet. 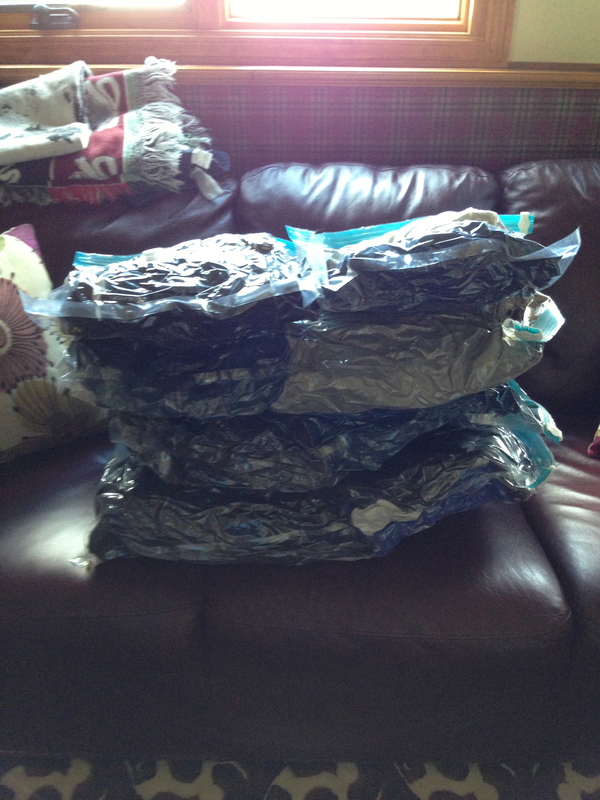 Want to see what three down coats, two long winter coats, one heavy leather coat, two pair of insulated over-alls, and a slew of other jackets look like in those space bags? They work! I emptied my shoes from the rack that is installed on the inside of our bedroom closet and put them in under-bed containers. I need to take the rack down. I bought three different size candles for the coffee table, a small silk flower arrangement for the dining table, new pillows for the sofas, and storage boxes for the closets to store loose things. I made another trip to Goodwill with a trunk full. I’m crossing off the list as I go. The biggest thing now is getting the stuff out of the garage and deciding if we are going to paint. Bill thinks he can find room in the pole barn to store our new house items. He doesn’t want to spend money on a storage unit or a pod yet. I have two closets to pack up and I think I will be ready to start painting. We are hoping Bill can work on some of the outside stuff next week/weekend if we ever get a break in this cold weather. 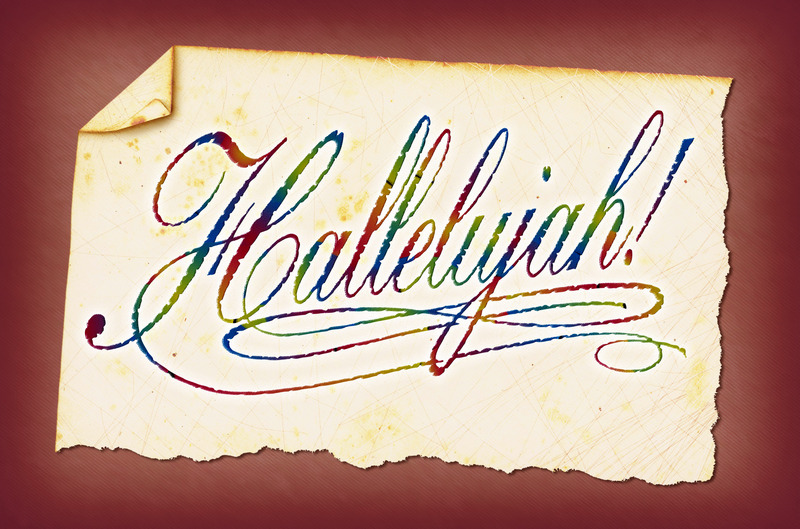 Bill’s last day to work is tomorrow – March 28!!!! He will be officially retired! Friday, we are going down to Jill and Jim’s for a long weekend. Monday, April 1, we drill for the well. We can use all the prayers you can spare that we hit water! We plan to meet with a couple of vendors while we are down there. We are changing our stone choice. Surprise!!!! We hope to pick out our hardwood floors and carpet and tile. And, we plan to meet with the pole barn builder again and see about other options. I’m sure I’ll be taking lots of pictures while we are down there. From here on out, I hope that my posts are current and short. They probably will be because I won’t have time to ramble on like this any longer. Our adventure has been on an upswing all these years. Now, I think we are approaching the summit and heading down. Mirror Mirror . . .
February 2013 was a month of de-cluttering again for me. I got back out my list I had made way back in the summer of 2011 and looked to see what items were left to do. Like the quote above, I didn’t want to fight with this old stuff anymore. I just wanted to concentrate on building the new house. 😦 But, to get to the new – I had to deal with this old. I cleaned out and organized the spare bedroom closet, all three bathroom vanities, a bathroom cabinet, the linen closet, and an antique cabinet. Bill was able to squeeze in a day where he replaced bulbs in our tract lighting in the kitchen and dining area and patched up some areas around the house. A couple of days after that I did touch-up painting over the repaired spots. We were also able to get our taxes done early and e-filed by mid month. Woohoo! Nice refund. And, if that wasn’t enough, Bill got a letter from Social Security confirming that he would start receiving benefits in March. 😯 Nooooooooo! It was supposed to start in April; he’s still working in March. After more phone calls to Social Security, he was told he had to go down to the SS office in person to get it straightened out. He decided to take off work and get there before they opened so he could be one of the first in line. He came home with a couple forms. His work had to fill out one form and we had to be fill out the other. Once we got those completed he asked me to drop the forms off at the Social Security office the following week. I wish I could say that took care of the problem. 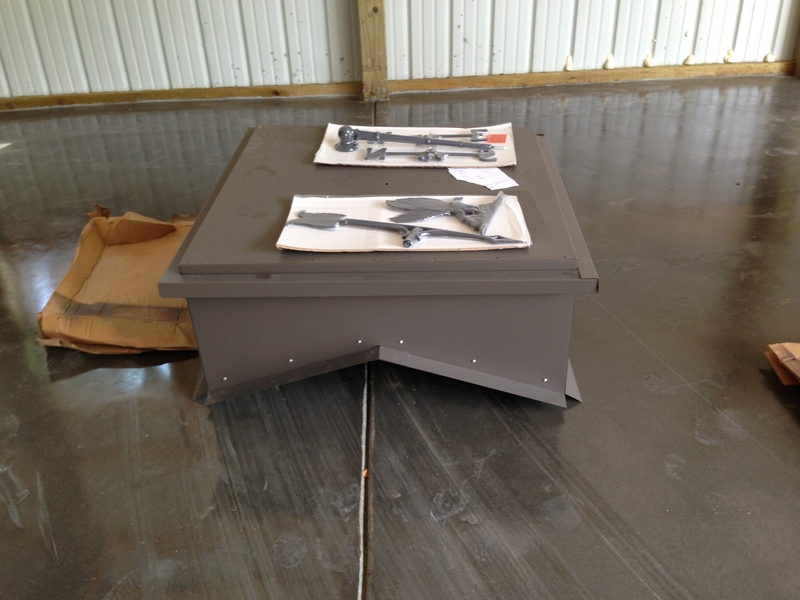 As weather permitted, Bill continued to build cabinets for the kitchen. 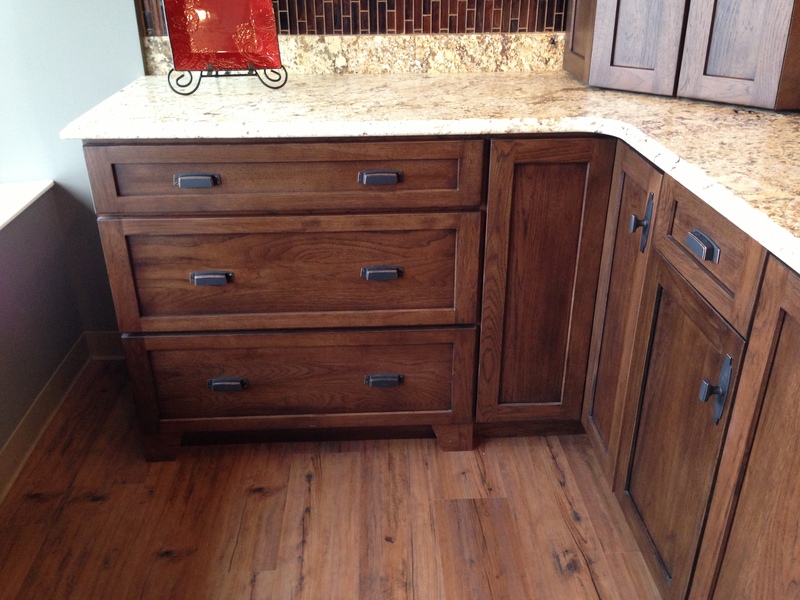 The corner base cabinet and corner upper cabinets were a pain for him to build. 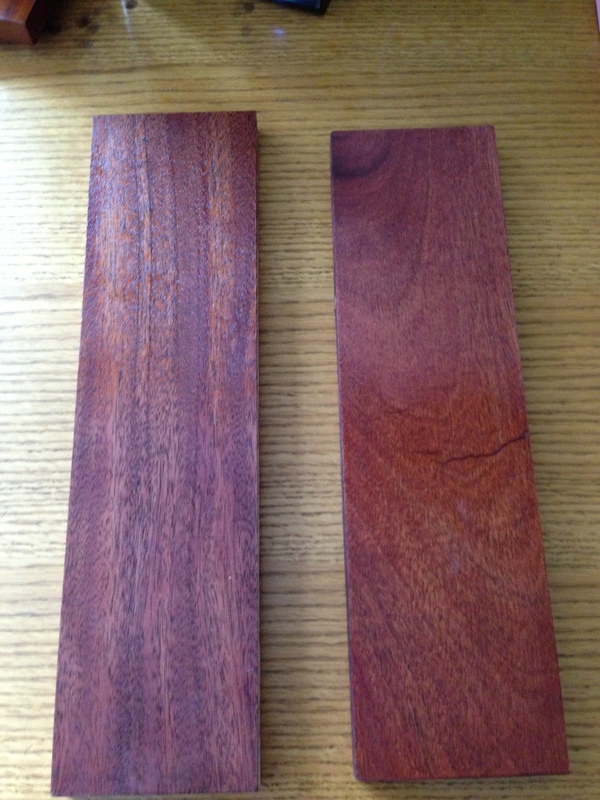 One exciting thing he tried was a tinted Danish oil technique on the mahogany instead of stain. He had gone to the woodworking show in January and watched a demonstration on it. Bill said it was so much easier to apply versus stain and he thought it would give me the dark rich look I was looking for on the cabinets. The left piece of wood is veneered mahogany (sides of cabinets) and the right piece of wood is solid mahogany (all the cabinet face-frames). There will be many layers of finish on top of the Danish oil so it will be even brighter when done. I was very pleased with the look. Unfortunately the tinted Danish oil doesn’t work with maple – the wood which Bill made the laundry/pantry cabinets. Those will need to be stained. Remember my last post when I said we thought our house plan changes were over? 😆 When Jim sent us the digital version of the forms at the end of February he sent us two other options of how our house and pole barn could be placed on our property. He called us and said that with the very wet winter, the ground was saturated. 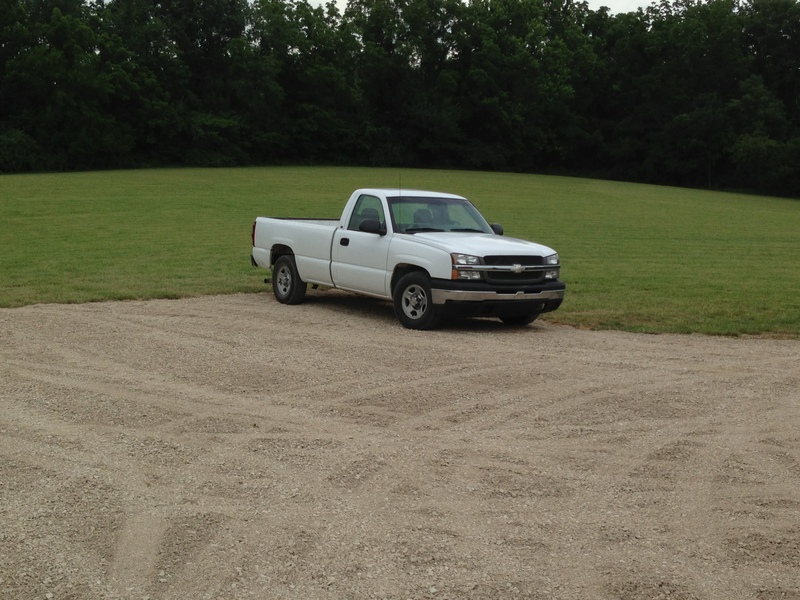 He thought if Bill ever wanted to drive back to the pole barn he would mess up the yard. 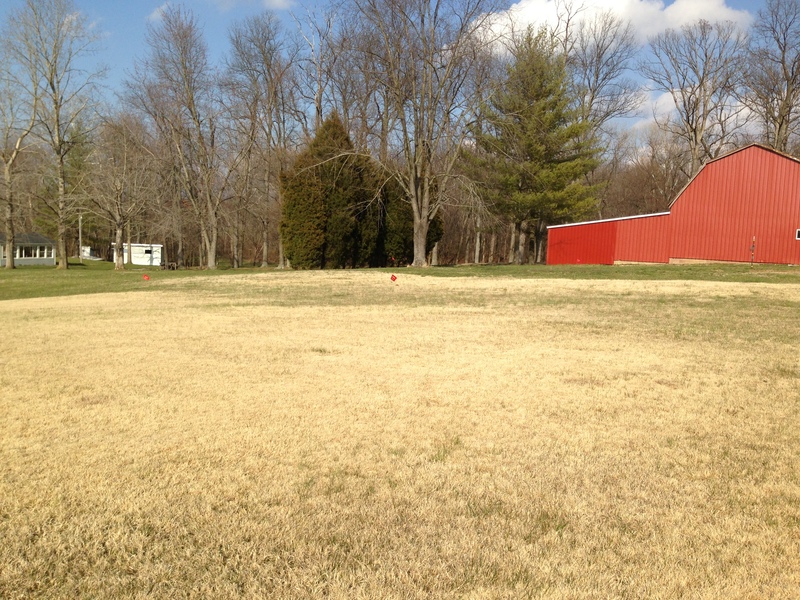 This was how we originally had the house and pole barn situated. We planned to share Jill and Jim’s driveway on the left. Jim said there was no pressure to select another site plan, he just wanted to give us options we might not have thought about. 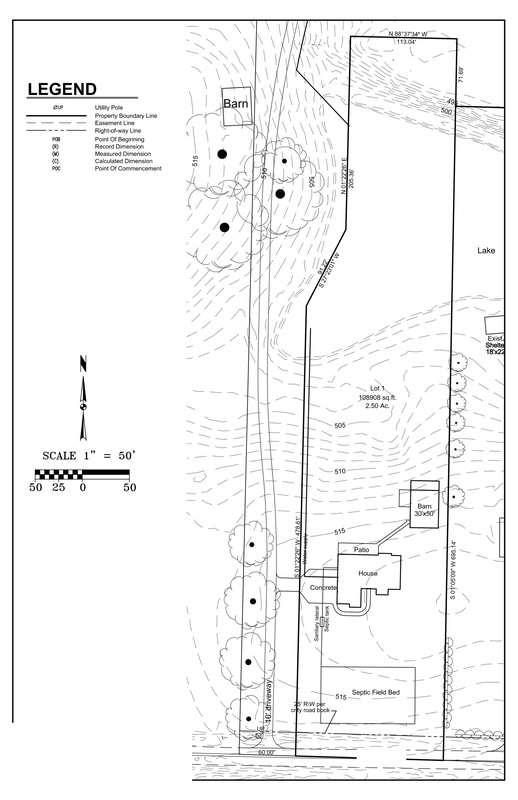 He said he had a “favorite” site plan he had drawn up, but he would not tell us which one it was. I even begged him to tell us and told him we respected his opinion but he wouldn’t tell us before we made up our own minds. Here was Site Option 1. 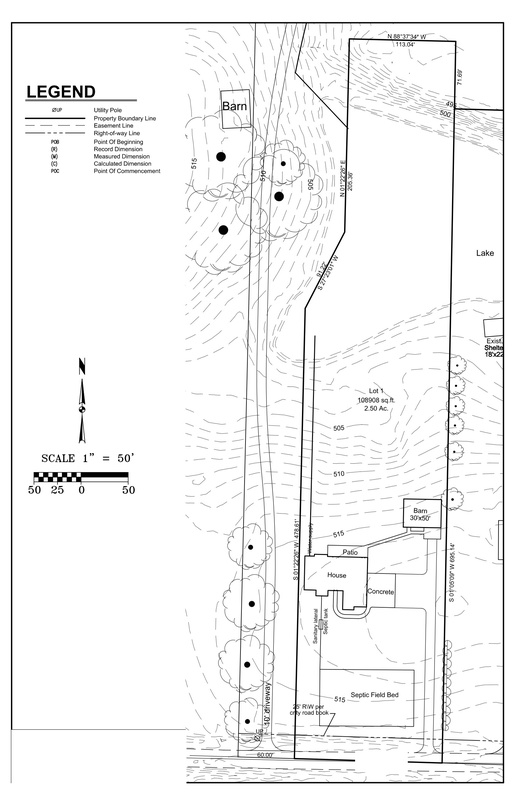 We would still share Jill and Jim’s driveway, but the drive into our house would be longer, the house would be pushed farther to the east side, and pole barn would be moved to the west side of the property. 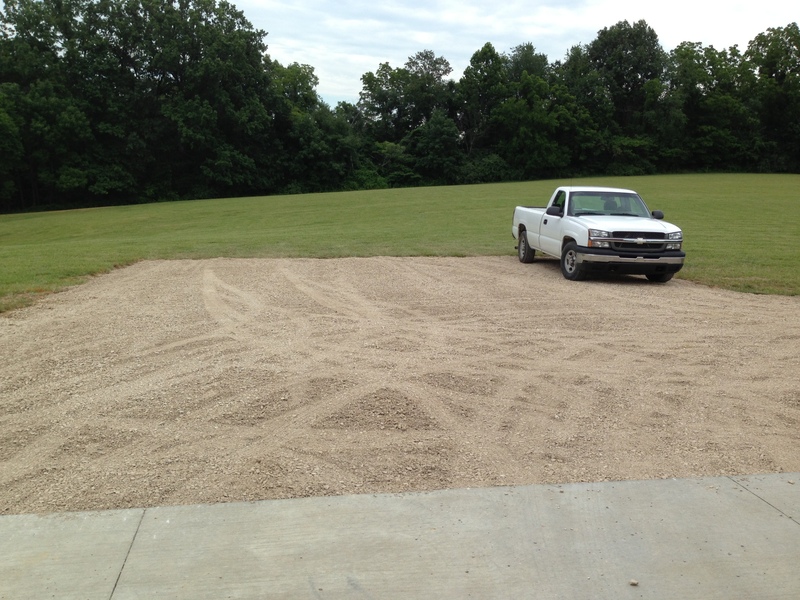 We would have a gravel drive off our driveway to the pole barn. Here was Site Option 2. We would have our own driveway on the east side of the property next to Jim, Sr. and Joan’s property. The driveway would extend all the way to the pole barn. The driveway towards our garage would be much wider and allow for double parking or plenty of room for backing up and turning around. The house would be pushed more toward the west. Bill and I really liked the idea of Option 2. We did like the idea of having our own driveway and it did offer driving to and from the pole barn, which Bill does a lot where we now live. But, here was the kicker. If you looked closely, you will see that in Option 2, the house’s orientation is flipped horizontally – it is a mirror image of what it originally was. I was having trouble wrapping my head around that switch. Whenever I cannot visualize something about the new house, I turn on the laptop and start up the 3D house design software. Bill asked me if there was a mirror feature on the software (which I had never used before). We found there was a mirror button. Yippee! I didn’t have to redraw the whole thing! As Bill and I looked at the mirrored floor plan we started to notice some issues. Really? Nothing is easy when making changes. 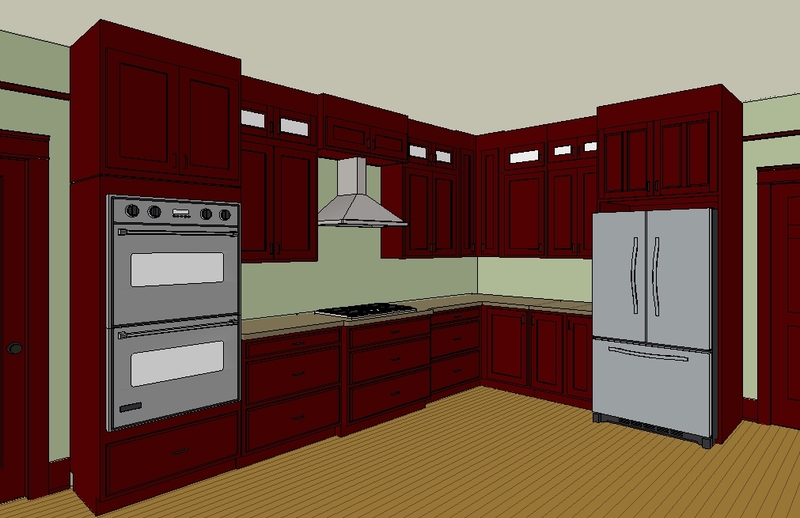 One of the biggest issues if we made the change was the kitchen cabinets. Bill said that his corner cabinets would not be correct. 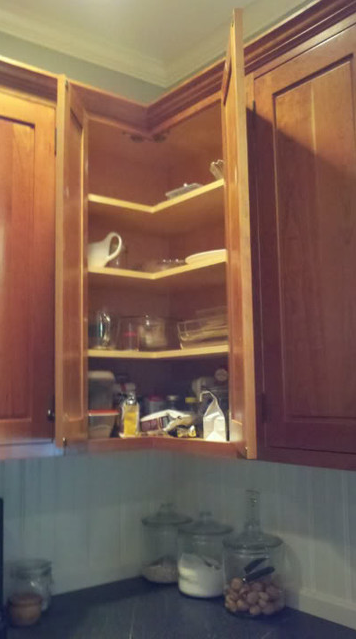 The sections of the corner cabinets were not symmetrical. On the base cabinet Bill had made a blind corner cabinet. 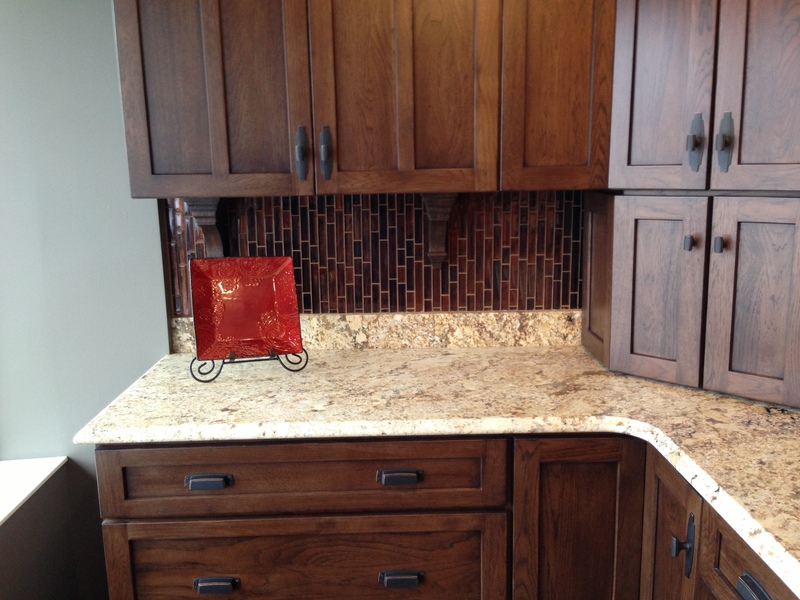 We had purchased a Rev-A-Shelf Blind Corner Cabinet Organizer. What he had built was in the orientation of the picture on the left. 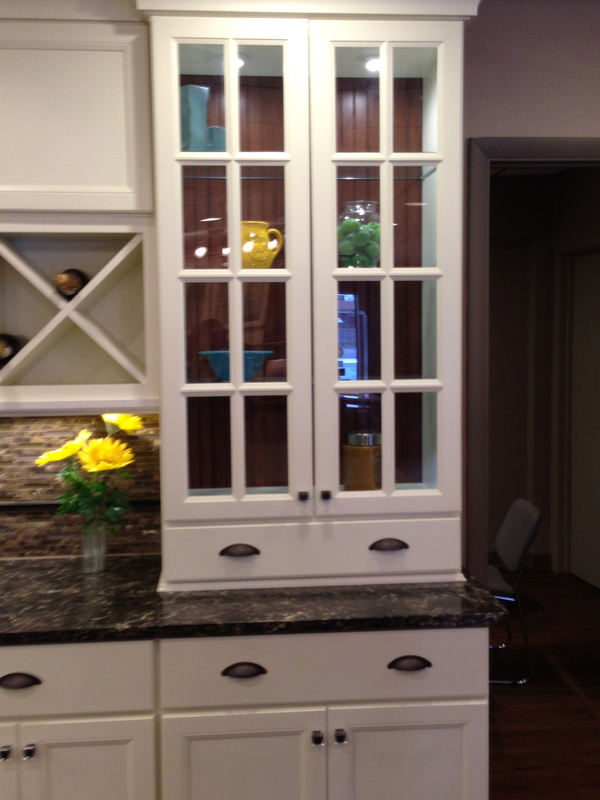 If we mirrored the house, the corner cabinet would have to look like the picture on the right. The upper corner cabinet was such a bear to build in the first place and Bill determined that most of it would have to be rebuilt. 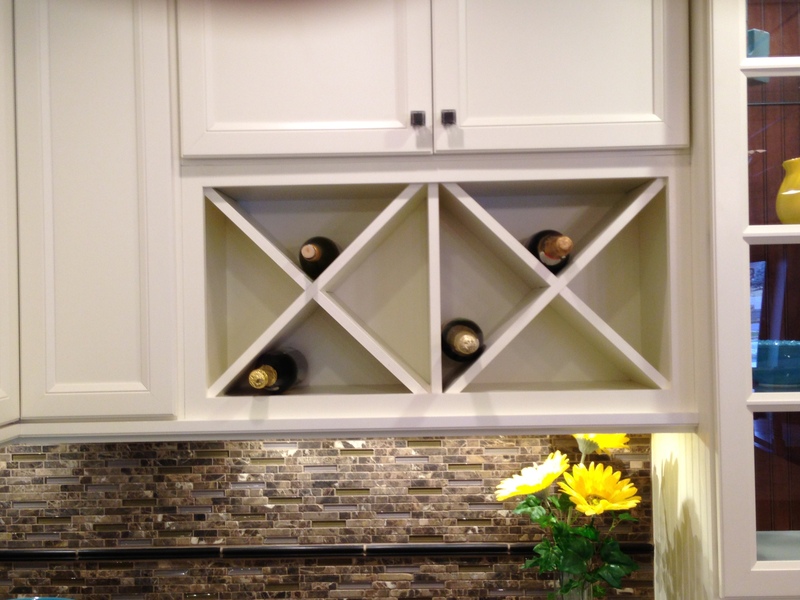 Here was the inspiration photo for the upper corner cabinet. In addition to the corner cabinets, Bill would have to remake a couple face-frames for cabinets on each end. And, he had to remake the side panel for the microwave/wall oven cabinet. The list was mounting. The second biggest issue was door hardware. 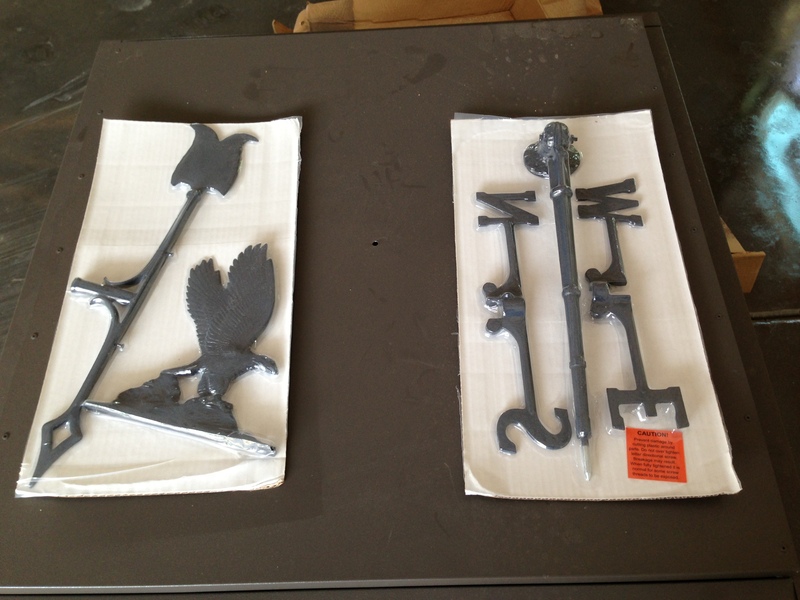 We had already purchased all our interior and exterior door hardware. In the mirrored house plan the doors were swinging in the opposite way than our original plan. If you used knobs as door handles, that would be no problem. However, we had purchased all lever handles. Bill and I got out all the handles and double-checked to make sure they would still work for the doors. The handles were reversible, so we were fine except for the front door. That door in-swing could not be changed. Because the front door is in the middle of the wall, we decided that we could keep it opening the same way as we originally planned. I let Bill make the final decision whether we made the mirrored plan change or not. He was going to be the one that had to remake cabinets. I would never intentionally ask him to do that. Plus, I worried about his time to get all the cabinets done period, let alone going backwards and remaking a bunch of cabinets. Bill gave the nod to Site Option 2 with the mirrored house plan. He said he would remake the cabinets because the new site option was a better plan. We called Jim the first part of March and told him our preference. It wasn’t until we made the decision before he would admit that Option 2 was his first choice, too. Thank goodness, Jim had a mirror image feature with Auto-Cad and didn’t have to re-draw all our plans from scratch. Of course, that didn’t mean there weren’t more changes to be made. Next up: Meeting with our realtor and a house stager. Well Well, That’s a deep subject! Bill had been doing some research for some time about drilling for a well in the area of our property. 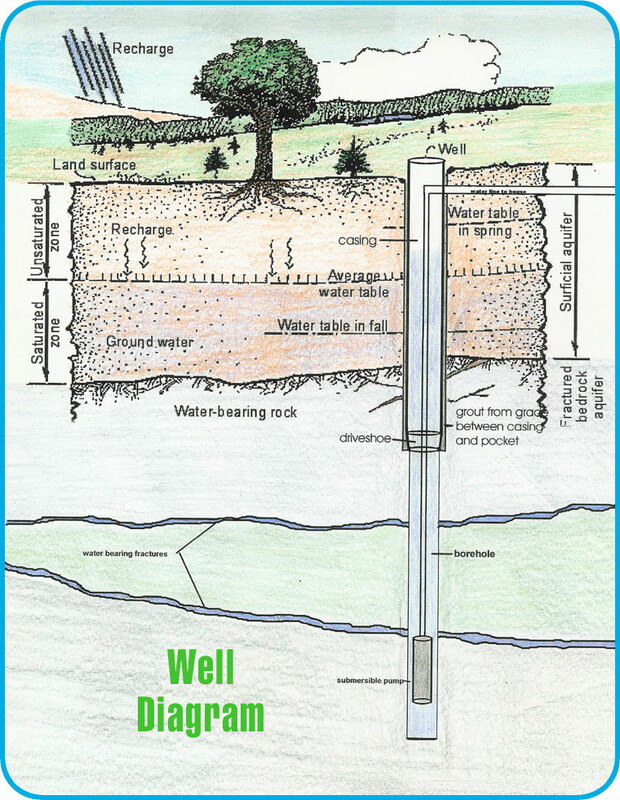 There are not many wells in that area. There is a lot of farm land around our property. And, it appears that we are on the very edge of an aquafer. All the water experts that Jim and Jill and Jim’s parents (from here on known as Jim, Sr. and Joan) talked to told them that the best access for water on our properties was to pump from our lake. There are fish in that lake! How could I bathe in that water let alone drink it? 😯 The other alternative was to install a cistern and haul water every week or so. Hmmmmm. The lake water is free. Hauled water costs money. Those two families went with the first choice and are presently pumping water from the lake and having it filtered with some pretty hefty filtering systems and filters. But it wasn’t easy getting to the clear water they have now. I think they went through at least two different filters before finding the one they now use – some micron sediment filter. One of the filters clogged up within one hour of the water being turned on. Yikes! I have to admit I do not know a lot about the water filtering system that the families are using. I do know that it has its challenges. Sometimes you have to wait a few minutes between people taking showers for water pressure. The system works fine for Jill and Jim. I’m not sure it is Jim, Sr. and Joan’s preference. Bill and I have a well at our present home. I don’t particularly care for the taste of our well water even with our osmosis filter. But, the water is free and clear. Other than that, we’ve been pleased with our well and pump over the years we’ve lived here. 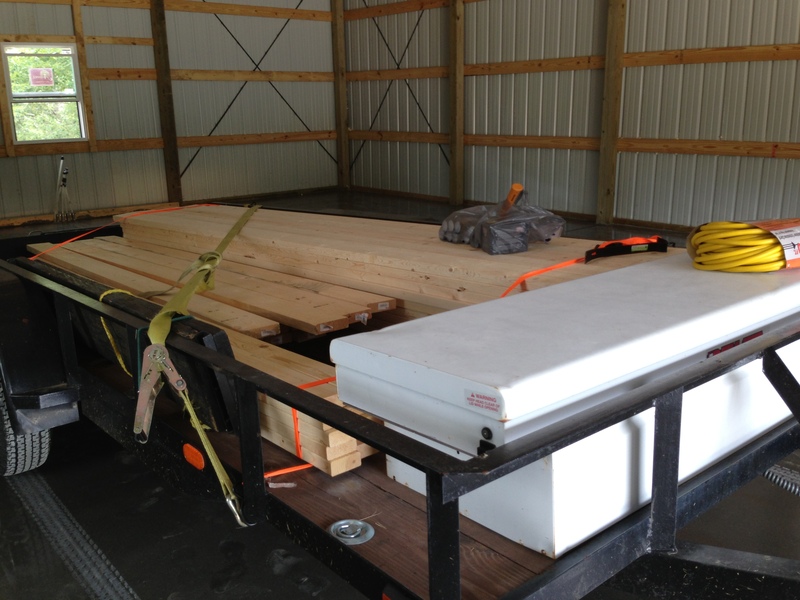 Bill contacted a well drilling company in southern Indiana. After several phone calls and emails, we decided to meet with a rep from the company on Saturday, January 26, down at the property. We met with the owner of the well drilling company and discussed the possibility of finding water. He said it was guesswork. We wished Bill’s Uncle Bill was still alive. He was a plumber by trade and Bill said he could always find the right spot to drill for water. It is a scary thing to risk paying that much money whether you hit water or a dry spot. Bill wanted to take the risk and that is what we have decided to do. The day after Bill retires, we are driving down to Jim and Jill’s for a long weekend. We are going to drill for water on Monday, April 1. We may be fools to try drilling, but maybe not. 🙂 Bill is going to get a fresh willow or crabapple branch and channel his Uncle Bill. Hopefully he will find the right spot to dig for water. If you want to know what I’m talking about, Google Y rod. Do I believe this will work? 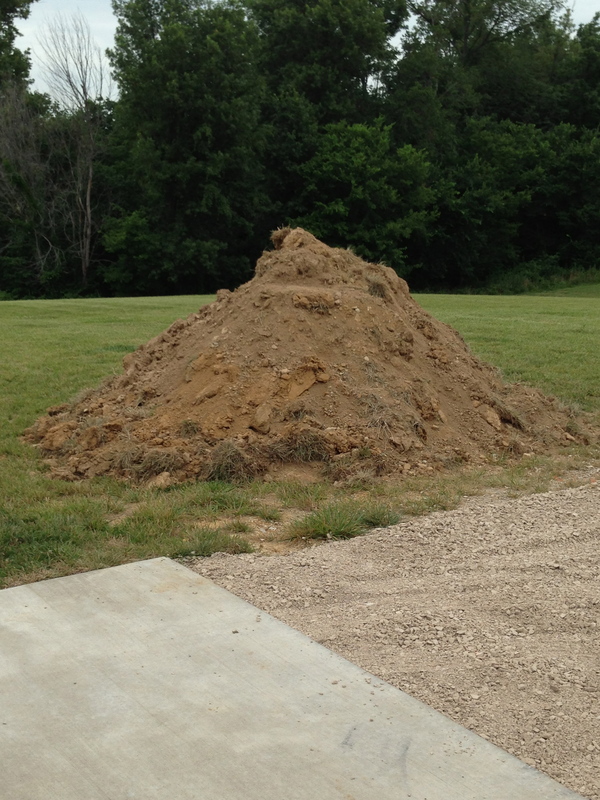 I don’t know, but the well driller said we were welcome to hire a dowser to find where they should drill. Bill is free. I trust his instincts. But, I’ll be praying for guidance from above. Another purpose for the January trip was to spend time with Jim going over our house plan corrections/deletions/changes. It’s ever changing! But, we’ve been told it is better to get all the changes done on paper prior to building to eliminate change orders and the high costs associated with them. The last visit Jill had helped me rearrange the hall bathroom in my 3D software, but I had never had Jim change it on our official plans. To cut back on costs, we decided to eliminate using beams in our gables and took off the stone on both sides of the house. There were some minor changes and there was one big one. Have you ever visualized something in your head and then when you see the real thing it isn’t anything like what you envisioned? 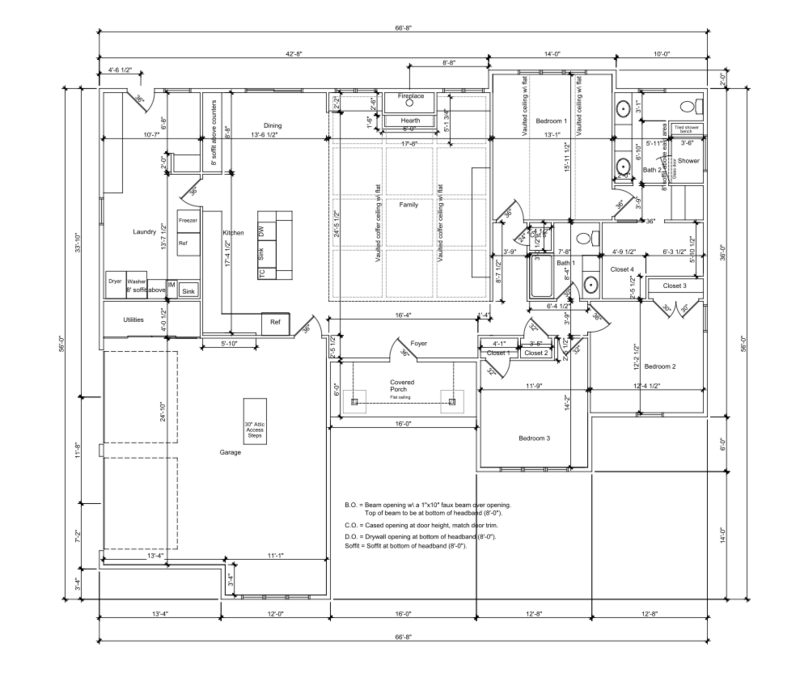 As I’ve said before, I have lived and breathed these house plans because I created them in the 3D software. I’m always checking this or that and comparing what is on our software matches what Jim draws up in AutoCad. I always knew that the vault in the family room was west to east. However, looking at the floor plan, you cannot tell which way the vault goes. You could figure it out by looking at the roof lines, but just in the flat floor plan you wouldn’t know. 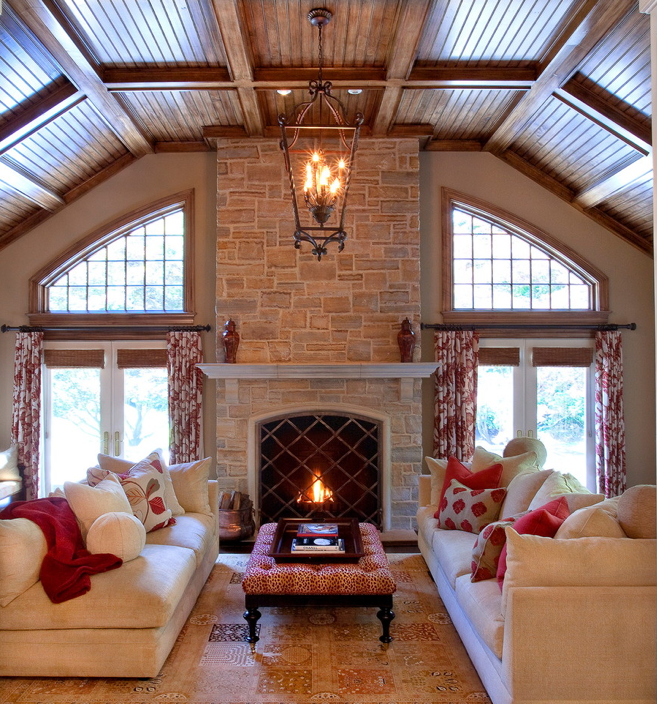 Here is a picture of the inspiration photo I had been using for the vaulted ceiling beams. Notice that the vault is going north/south – not west/east. That made no difference to me because I knew which way the vault was suppose to go. However, since Bill had seen this picture over and over again for months, he always visualized the family room vault to look just like the photo. While I was showing Bill some more inspiration photos one day he said, “Wait a minute! That’s not the way I ever envisioned the family room to look!” 😯 Oh my! Now, what should we do? We discussed whether this was a deal breaker or not for either of us. Bill wanted the vault changed. But, if we made that change, we should move the fireplace from the east interior wall to the north exterior wall. And, if we do that, we need to get rid of the sunroom which was north of the family room. This was a domino effect. 😦 I pulled out the laptop and started changing things to see what it looked like in the 3D software. This was a very big change! I found two inspiration photos. In the first photo below, I didn’t think we would have room to put two doors on each side of the fireplace. We liked having some higher windows, but wasn’t sure if that was possible if we were using a gable there. Love the wood on the ceiling, but we need to cut that out. No budget for that. 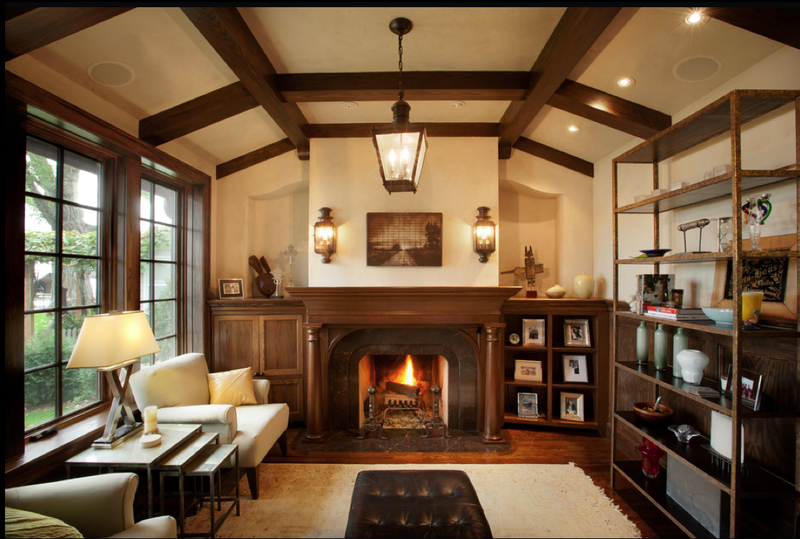 This second photo is strictly an inspiration photo of the ceiling beams we want. Here is a pic of the floor plans and the north/south elevation plans with the changes. Jim got them done for us at the end of February. With these changes, we said we were done. We would concentrate on getting our present home ready to put on the market and getting Bill retired. In the next post I’ll share how we struggled with all three of those. New year, new milestones, new adventures, new house? As I start each new year I naturally reflect back on the previous year as I write important dates on my new wall calendar. 2013 was no different. I took down the 2012 calendar and went through it month for month adding birthdays, anniversaries, and other important reminders on the new calendar. So, while I was reflecting, I noticed I left out a couple of things which happened at the end of 2012. I think I hinted a couple posts ago that there would be even more new improvements added to our house. Turns out that while we were down to visit Jill and Jim in September, we had a hail storm back at home. Our neighbor called Bill to tell him that while we were away. When we got back home we didn’t see any visible damage but Bill thought I should probably call the insurance company just in case. Long story short, we had lots of damage. Enough damage to warrant a new roof on the house and the shed and new gutters! Of course, you might know that the year before our homeowners insurance had changed our policy that our deductible for any hail damage would be 10% of the house value instead of our usual $500. The good news: we still got a good deal and new owners of this house will appreciate a new roof and gutters. I hope! 🙂 The roof and gutters were installed in December. The bad news: the roofers messed up three of our new windows! 😦 Unfortunately, they are the three awning windows in the front of our house. They bent all the flashing. We did deduct the amount of the repair from the roof bill. However, we are still waiting to get those windows repaired. The window guys said it needs to be above freezing for them to be able to caulk. So, we wait until this silly winter ever ends. Another improvement we made in late 2012 was to have the front concrete landing torn out and another concrete landing installed. This was an eye-sore ever since we bought this house. There was a large crack in that landing. After we purchased the house, we had a company “shore up” the landing and add concrete to the crack. 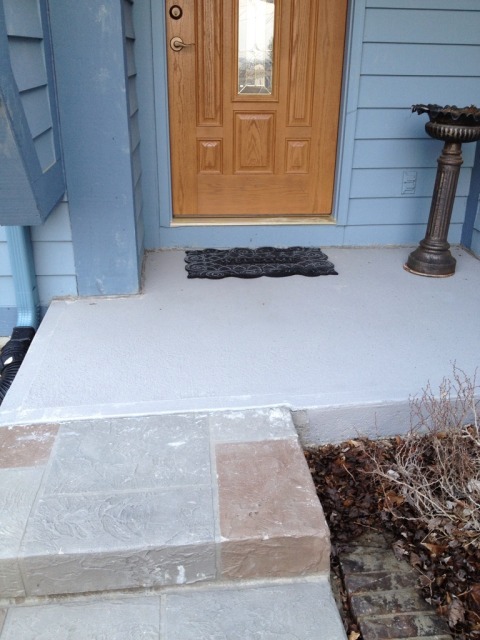 In addition we had added a concrete overlay pattern on the landing and the walkway up to the house. But with every winter of freeze and thaw, that landing would crack again. Our neighbor’s adult son does concrete work for a living. He just happened to be next door at the right time and gave us a great price. It looks much better now. It will definitely make a much better first impression before entering the house. We still need to power wash the walkway and front landing, but here is an after pix. I’m ready to move on to 2013! Thirteen has not been an unlucky number for me and Bill. We were married on April 13. 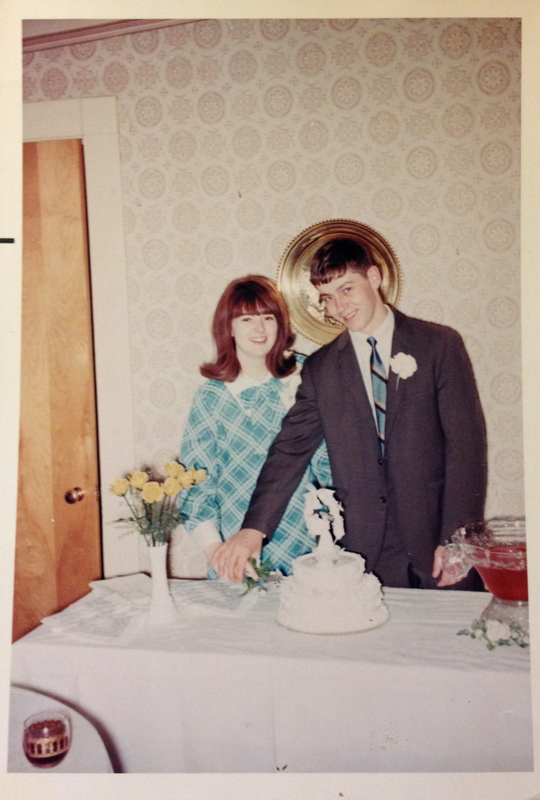 This year we will be married for 45 years!!!! Our son and daughter-in-law were married on March 13. So, we feel that 2013 will be a GOOD year for us. Early in January we set up a meeting with our financial adviser. We had been working with him for years planning for these days ahead. The purpose of our meeting on January 8 was to discuss Bill’s retirement date. Should he retire at the end of March or wait until August? I have to tell you . . . we feel that our financial adviser, Mike Wagner was a Godsend to us several year ago. Our first financial adviser was young and was recommended by someone from school. He set up a couple of accounts for us, but Bill did not connect with him. That was a problem. You have to have trust in someone who is going to be handling your money for your retirement. Bill heard about Mike through a co-worker. We love this guy and his assistant Andrea. Talk about customer service! Good customer service is hard to come by these days. These two are always willing to help us. Once that was all done, Mike suggested two things. First, he said that even though everything on paper showed we were in good shape, he thought we should contact some financial institution to see if we actually qualified for a construction loan for the new house. I had worried about that for some time. I didn’t know anyone who was retired and was building a new home and would have a mortgage. In addition, Mike said that the laws had changed so much in the last several years, he just wanted to make sure we knew what was ahead of us beforehand. 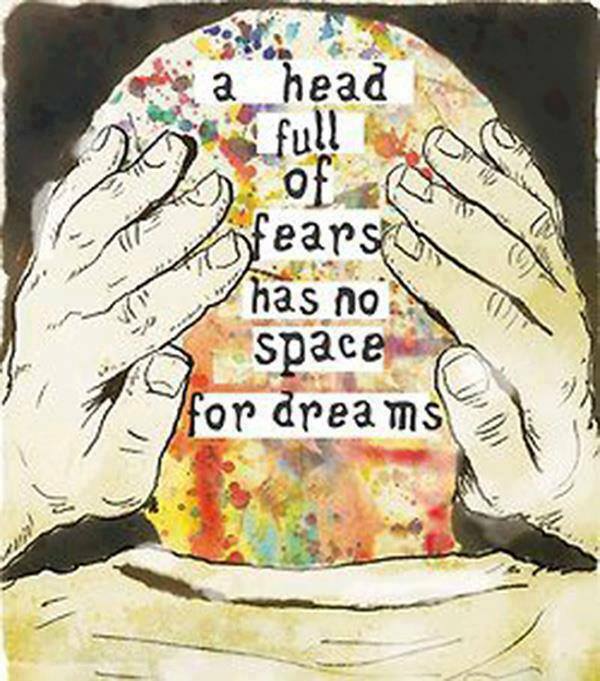 This turned out to be great advice! We even talked about taking the money out of our investments and paying cash for the house. Mike said he didn’t see anything wrong with us having a mortgage since we could still deduct property taxes and mortgage interests from our taxes. The second thing Mike suggested was that in the whole scheme of things, there really wasn’t a huge advantage financially for Bill to wait and retire in August. He said if Bill was ready to go sooner, he should retire at the end of March and start enjoying retirement. Months before I had contacted our bank about a construction loan and had corresponded via email with the regional loan originator about some generic information and qualifications. I called her the next day and set up a meeting on January 16 to see if we could go over our scenarios. She emailed me several forms which I filled out during the week before we met. Remember all those items we had purchased for the new house? Remember me mentioning that there was a specification document that went along with our house plans? Those two played together and became very important for the meeting with the loan originator. Most people do not buy materials/items before they build. Those items are all rolled into the “build” price as allowances from the total amount you borrow. We were trying to mortgage as least amount of money as we could. So buying stuff beforehand was our way of decreasing our mortgage. However, those items also acted as equity in the new house. 🙂 Our land purchase was paid off. So, the land plus the house purchases all could be applied toward having 20% down. In addition, we also plan to put a good chunk of money down from the sale of our present home. Enough about the dreaded document! I ended up creating several spreadsheets before our bank meeting: retirement budget; new house bid budget; improvements to the land costs; and materials/items we purchased along with costs. The loan originator didn’t ask for this information beforehand, but every bit of it was necessary during our meeting to determine our qualifications for a construction loan for the amount we needed to build the house and the pole barn. I’m going to brag here – I’m glad I had the time and know-with-all to have thought about this before our bank meeting. We ended up going through several scenarios of income and costs. We wanted to see if we qualified for our worst case scenario. We did qualify even without me starting Social Security. YAY!!!! However, the loan originator said that our retirement income would need a history and a paper trail for us to qualify when the time comes. Meaning, she suggested that we immediately start taking out our monthly allotment from our investments. She said we would have a paper trail from Bill’s work income and his Social Security. We had a paper trail from my retirement fund payments for the last several years. She said if we waited to start taking out from our investments until right before we started to build, we would probably be declined. 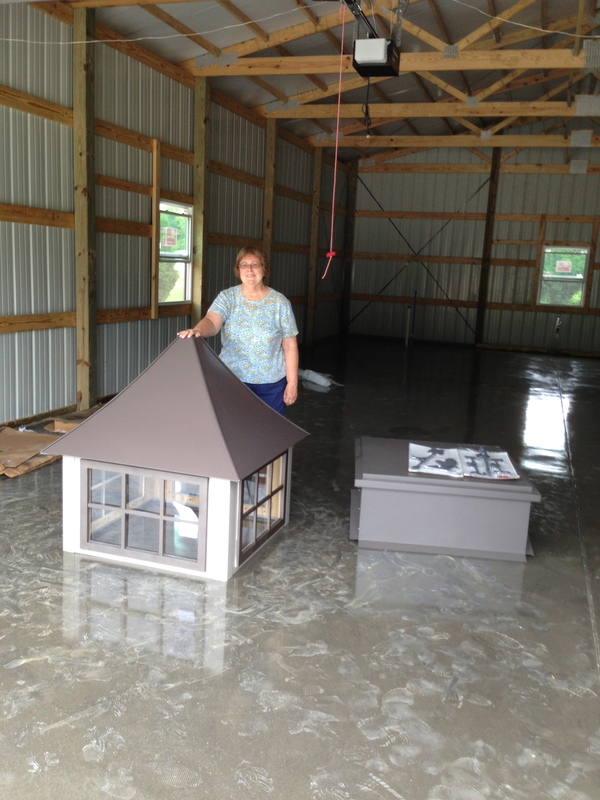 She said a retired couple had come in a few weeks before us and wanted to start building a home. However, they were declined for a home construction loan because they had not been taking out a monthly income from their investments. They had a portfolio to show how much they had in their investments, but because there was no paper trail of a monthly income from it, they were declined. We were so glad we checked all of this out sooner than later! After the meeting, Bill and I hugged each other out of relief that we were going to be able to build our dream home and workshop pole barn. Bill looked at me and said, “I’m going to retire on March 28!” He made it official the next day at his workplace. Whew! Next up: Well, well, well. 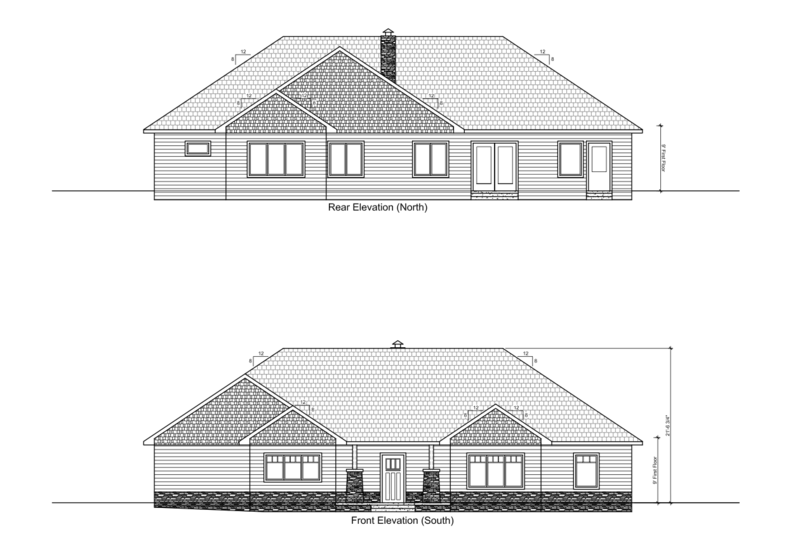 And, another house plan change!